Can You Resist a Tissot T-Race Chronograph Watch? Tissot has generally focused its efforts on the moderately high-end watch market. For the most part, their various offerings have succeeded in making them a major force in this niche. Seeing that this Swiss company’s been in business since 1853, this shouldn’t be a surprise. 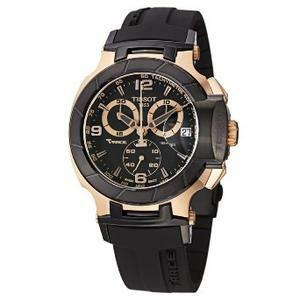 One good example of what they typically offer is the Tissot T-Race Chronograph Gent. This particular Swiss-made watch gets its inspiration from motorcycle racing and it shows in both its features and its styling. It’s yet another offering in their quest to make the best chronograph watch. How does it live up to what is expected of it based on the Tissot’s brand reputation? Read on to find out. To get an idea of what it has to offer, I’ll mention its basic features first. As a chronograph watch, it includes a 60-second timer, a 1/10 second timer, and a 30-minute timer. Under the hood, the T-Race uses some of the finest Swiss quartz movement to supply some highly accurate timekeeping. Holding all of this in is a sapphire crystal cover and stainless steel case. The result is a watch that can handle rough sports and long exposure to water in the form of swimming or bathing. Specifically, it’s rated to 330 feet under water. 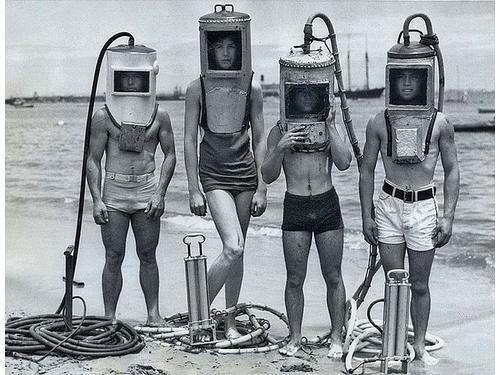 This would only exclude things like scuba diving and other activities with similar high water pressures. 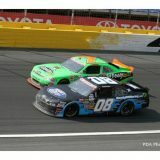 If you’re into car racing, you’d definitely have heard of Danica Patrick, one of the greatest female racer. If a Tissot T-Race is tough enough to survive when worn on Danica Patrick’s wrist, what does it say to most ordinary folks like you and me? I leave it to you to figure it out. Based on the various tough watch reviews talking about Tissot T-Race Chronograph watch, owners often rave about the superior scratch resistance due to the use sapphire crystal. This isn’t a big surprise since sapphires are only surpassed by diamonds in hardness. Appearance-wise, this watch is clearly made for men. 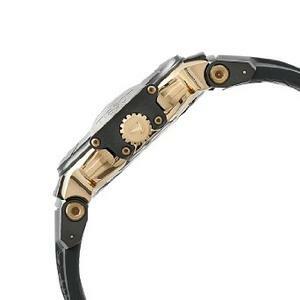 It has a strong mechanical look to it with a black and rose gold color combination. 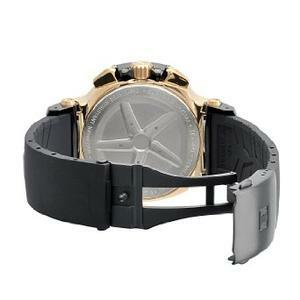 The rose or pinkish-gold edges are provided by the stainless steel case. The watch face is a bit unusual in that the second hand of the main dial acts as the 60-second timer. In addition, there are three smaller dials on the face. The one at the bottom is the actual second hand for everyday timekeeping. Above this dial, the 30-minute timer and 1/10-second timer sit side-by-side. Amusingly, these two dials are each highlighted in rose gold. This creates a vague silhouette of a motorcycle. Also, the watch crystal is framed by a black ring with slanted markings that hints at a motorcycle brake disc. The T-Race also provides a date display on the right-hand side next to the control buttons. Basically, it has all the normal features of a popular chronograph watch. I would have to say the biggest downside to this watch is the wristband. To be sure, for a rubber wristband, it is heavy, durable, and comfortable. The problem is that it doesn’t rely on the common buckle-type latch that’s easily adjustable. 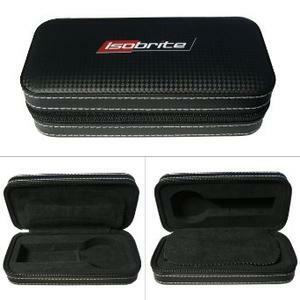 Instead, it possesses a double-hinged clasp that can’t be adjusted by itself. If you have an exceptionally small wrist, to fit the wristband to your wrist, you have to do a little surgery on it. The clasp detaches so that you can cut the band down to size by removing clearly defined segments. This extra chore can be a little annoying. What’s worse, though, is that there’s no going back. If, for some reason, the wristband needs to be bigger in the future, you’ll have to get another band. It’s obviously not the best chronograph watch feature around. Overall, the Tissot T-Race Chronograph fits the bill for a general-purpose watch. It’s very stylish for tough watch standard and maybe it can hold its own against the much more expensive Rolex in a formal setting. If gorgeous design alone is not enough, this popular choronograph watch has the quality ruggedness and features you’d want in a sports watch in its price-range. With its good looks, though, you’d probably be loathed to use it for such things. Still undecided? You may want to find out which tough analog watches are most recommended for price range similar to the Tissot T-Race Chronograph. Buying a diving watch is a real investment, so it pays to weigh the available models and their pros and cons carefully before making a purchase. The watch needs to be able to hold up to the stresses of diving. This is the foremost concern. The best dive watch needs to be strong. 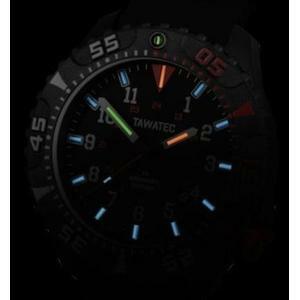 In this tough watch review, I will discuss some important things to consider when it comes to finding the best dive watch and I’ll take a look at Tawatec’s E.O. 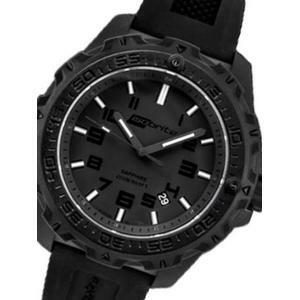 Diver Mk II Tactical Watch. A dive watch needs to be more than hardy. 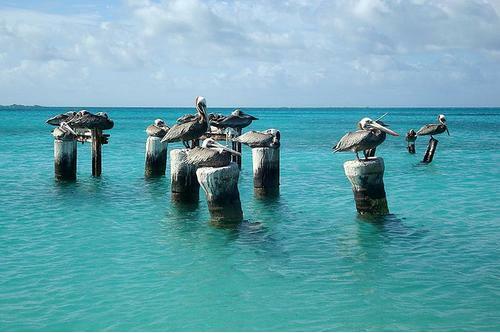 Each part needs to be resistant to the hazards of diving, and it needs to be readable while diving. That requires some kind of glowing watch face. 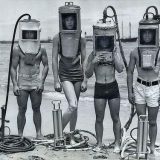 Many dive watches, including the E. O. Diver Mk II, use tritium as a light source to illuminate the hands, and you’ll soon find out why such technology proves to be superior. The E. O. Diver Mk II from Tawatec is a Swiss-made watch that portrays itself as built to the specifications of divers who disarm underwater mines. While it’s debatable if this is the way to actually build the best dive watch, the Mk II certainly attempts to live up to the hype. Tawatec’s E.O. Diver MK II uses an anti-magnetic case to protect itself against magnetic emissions from the watch interfering with such operations. 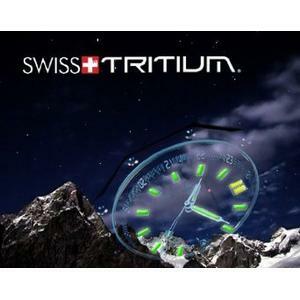 The watch has bright tritium markings on the hands and face. This makes it easy to read at night and underwater. 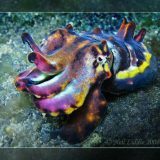 It also has one of the largest faces in its class. It is rated water resistant to 600 feet and certified resistant to 20 ATM of air pressure. The face has scratch-resistant sapphire crystal with an antireflective coating. The band is rubber and is 22 millimeters wide. The watch and band are both black. The movement is a Swiss quartz assembly. The display is analog, of course. But if you’re interested in nothing but the best, you may want to check which watch emerged as the winner in our match-up of the the toughest analog watches. When it comes to whether or not this is actually the best dive watch for the money, the evidence is mixed. There are accounts online of build quality issues, particularly for the previous version of this watch. Several users report that the bezel popped off after less than a year, and others say that the band that came with the first version was cheap and flimsy. Some even had trouble getting the manufacturer to honor the warranty. But besides the pockets of negative reviews (which I don’t rule out them being lemons), the reactions to the Mk II have all been positive so far. Most owners who ran into problem with their watches (when they were still under warranty) share how the company was quick to respond. If they can be fixed, you simply send the watch over and they’ll fix it for you. If they can’t be fixed, you’ll get a replacement with not much hassle. While I’m not saying anyone going for military watches has to from the military, I believe most are. Based on the reviews that many owners have shared, there is reasonable evidence to believe that this watch has the toughness that as demanded by military personnel. So, if you’re looking to differentiate from the G-Shock military-inspired watches that almost every of your buddy is wearing, you now have a choice. You have with you all the information that’s important to decide if this is the best dive watch you want to carry for your upcoming search and rescue (SAR) operation or diving adventure. I have my final scoresheet to make my decision but your scoresheet might be different from mine. Consider all the pros and cons, weigh all the things that are important and decide. If you’re still unsure and you’ve a budget of less than $500, you may want to find out which models are considered as the best diving watches for $500 and less. 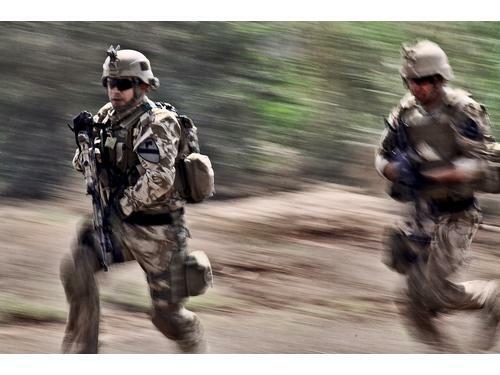 Is Smith & Wesson SWW-12T-R Tough Enough to Survive a Mission? 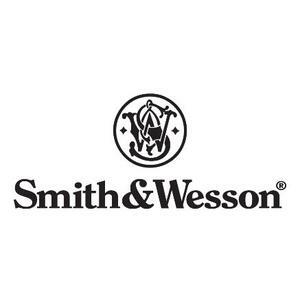 Although Smith & Wesson is mainly known for its firearms and personal protection equipment, it also makes a variety of watches. While these watches are often used by military and law enforcement personnel, they are equally appropriate for civilians who appreciate the style and many features of military watches. Anyone seeking the best military watch should consider the Smith & Wesson Men’s SWW-12T-R Watch. When seeking the best watch for military use, you must look for many features. 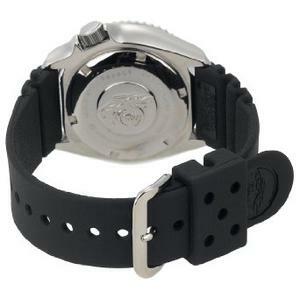 Many of these are included in the Smith & Wesson Men’s SWW-12T-R Watch. For example, it comes equipped with titanium light source. This makes it extremely easy to read in even the darkest conditions. The hands are green titanium and there are also orange titanium markers at the 12, 3, 6, and 9 hours. This watch is designed to provide glow for 20 years. 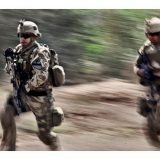 Visibility in darkness is of practical value in many situations, whether you’re in the military or coming home late at night and want to check the time in a dark area. The watch is also well designed for its primary function, to tell time. It has a Swiss quartz movement and displays for hours, minutes and seconds. Another essential component of a military watch is durability under a variety of conditions. 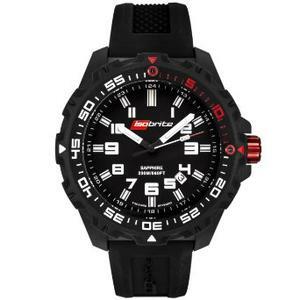 This watch has a sturdy stainless steel case back and is protected by hardened glass that is scratch resistant. In addition, the watch is water resistant to 330 feet or 100 meters, which makes it suitable not only for showers and swimming but also recreational scuba diving. Mind you that water resistance is not water-proof and this watch has not been designed with professional divers in mind. If you need a high performing watch for your diving adventure, you might want to check out which are the best diving watches. It’s also resistant to oil and most corrosive and harmful materials, which makes it a good watch for anyone who works in an environment where exposure to dirt, grease or chemicals is unavoidable. The Smith & Wesson Men’s SWW-12T-R Watch also has a stylish appearance, which is enhanced by the black rubber strap. 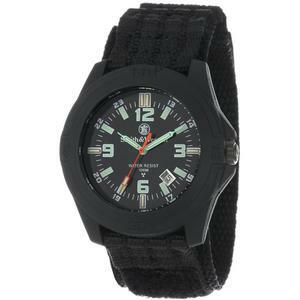 This is a watch that will be appreciated by anyone who likes military style or even sports watches. The display type is the traditional analog style, which is good for people who prefer to look at a clock face rather than digital readouts. 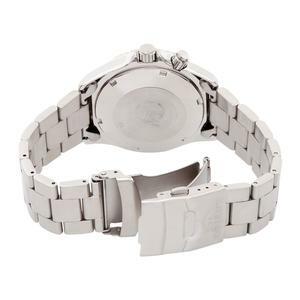 The watch comes with a limited one-year warranty that protects the buyer in case of defect or certain types of damage. When seeking the best military watch, you have to consider many factors, including your budget. 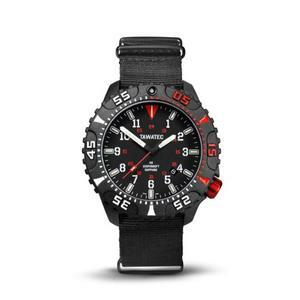 This is one of Smith & Wesson’s more reasonably priced military watches. Yet, it provides quite a few impressive features. 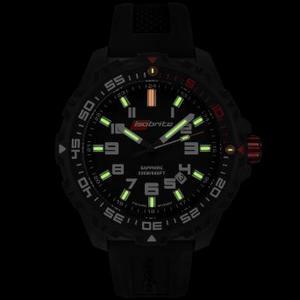 Its high visibility in the dark, water resistance and durability are features loved and required by field personnel in need of a tough watch. But let’s be real. For the price range that SWW-12T-R is fetching, you can’t expect perfection. If you’re seeking a timepiece that is accurate to the millisecond this may not be the ideal choice. While its accuracy is fine for casual use, the main appeal of the watch is its durability, water resistance and sleek appearance. If you really need a tough, low maintenance and yet accurate watch, you may want to consider the likes of G-Shock Frogman watches that are usually equipped with atomic timekeeping functionality. Is Smith & Wesson SWW-12T-R Worth Your Bucks? If you’re seeking the best watch for military use, there are many different choices. The quality of a watch must be considered in relation to its price and how it compares to similar products. Smith & Wesson has been a trusted brand name since the 19th century, which is another factor that makes this watch appealing to many consumers. The Smith & Wesson Men’s SWW-12T-R Watch is a military watch that provides good value for anyone seeking a durable and highly versatile watch. Do you think Smith & Wesson SWW-12T-R has the toughness and features that you need in a tough watch? If not and you’re looking for watches suitable for military use, why not check out our list of best military watches. Find out where this watch stands among its peers. Can Seiko Men SKXA35 Automatic Dive Watch be any Good? 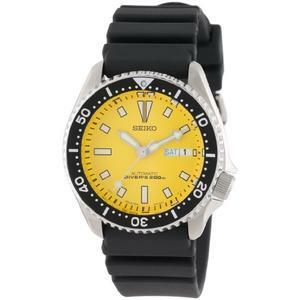 When it comes to finding the best dive watch, it’s important that you are able to find something that will provide you for accurate results under the water, while also being sleek and stylish enough that it doesn’t become constraining with your dive suit. The Seiko Men’s SKXA35 Automatic Dive Urethane Strap Watch fits into all of these desirable traits, making it a top tough watch pick for any diver that is looking for a reliable timepiece. Let this dive watch review take you on an in-depth view of Seiko SKXA35. Read on to find out what you can expect from this particular piece. 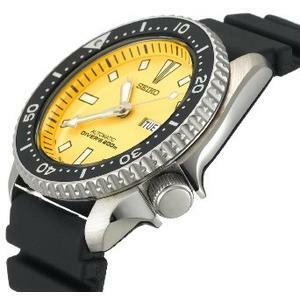 The first thing that sticks out in mind with the Seiko SKXA35 is the bright yellow faceplate. For those that are looking for a watch that stands out, without being incredibly intrusive, this is the perfect combination. Also on the faceplate is a section that shows the date, as well as the week of the year. If you are looking for a minimalist look that provides you with what day of the week it is, as well as an accurate count for the time, this provides both. The outer dial is in black, with offset white markers that represent every ten-digits. The back of the face of the watch is also flat, which prohibits any uncomfortable feelings that would otherwise rub against your wrist while wearing it. Lastly, the urethane strap offers a variety of different size settings, which makes it a viable option for individuals with different wrist sizes. In culmination, the entire design of the Seiko SKXA35 is built with boldness and elegance in mind, without being overwhelming or obtrusive like some other larger dive watches on the market. No dive watch review would be complete without explaining how deep the watch can go for diving. The Seiko SKXA35 is water resistance up to 660 feet and will withstand pressures of most dive depths. 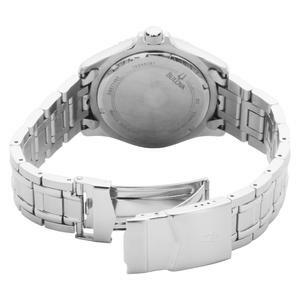 One issue with many watches is that they may begin to develop moisture under the faceplate. Once this is there, it can be hard to get it out without taking your timepiece to get it fixed. However, the strong material that this tough watch is made from, along with the overall workmanship and water resistance workings, ensures that this watch will not accumulate moisture inside of it. This is incredibly helpful when looking for any type of watch that you plan to be using in and around water. Whether you use this watch occasional around water or if you find yourself continually immersed in water, the Seiko SKXA35 is going to be able to withstand and hold up to the conditions. Another important factor for any watch is the ability to keep time correctly. When it comes to any watch, being off by just a few seconds each day can make it so that the timepiece needs to be readjusted on a regular basis. The key for keeping the Seiko SKXA35 up with time is that you wear it regularly or that you store it on its back when it’s not being worn. This will help the watch keep time better, without seconds ticking off and making it either faster or slower than what you would want. The bezel of the watch also makes it to where you can keep more accurate time, unlike watches that make it difficult to track seconds or more detailed time. Is Seiko SKXA35 a Great Investment? 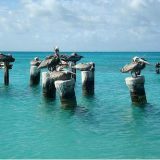 When you are looking for the best dive watch for you, it’s important to keep in mind all of the points mentioned here. The ability to withstand water, the comfort and appeal when wearing the watch, and also the ability to keep precise time without skewing too far one way or the other. With the Seiko Men’s SKXA35 Automatic Dive Urethane Strap Watch, you get all of the benefits that count. Not only is this a great looking watch, but it is also able to withstand a variety of conditions while keeping you comfortable the entire time. 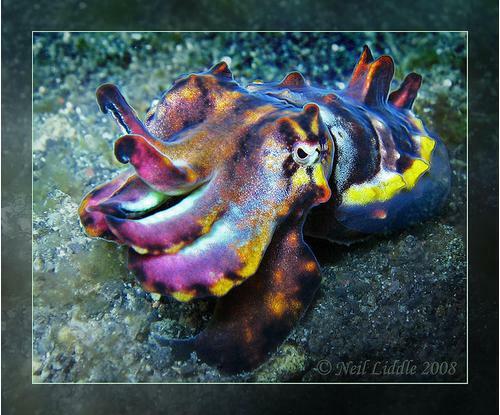 Do you think it makes the cut to be considered as your diving companion? 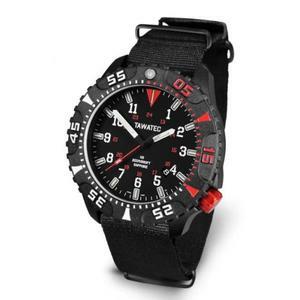 If you’re still unsure, you may want to check out our handpicked list of the best dive watches. 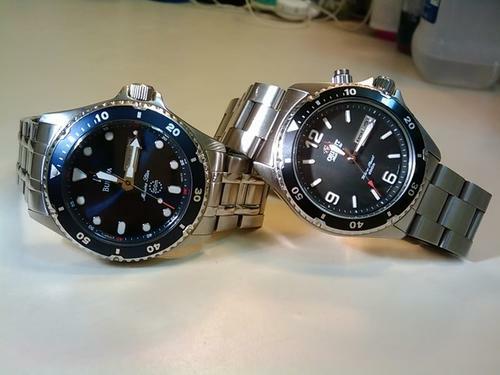 Orient Mako vs Bulova Marine Star: Help Please! When you can’t innovate, copy! Copying a product with proven success is probably one of the best strategy that any marketing student will tell you. We don’t have to beat our brains to come up with a good example. Samsung’s smartphone business is one of the most recent high profile copycat business that rakes huge success. I can quote many examples, but that’s not my point here. In this article, I’m going to highlight two considerably tough watches. If you’ve seen their pictures, you’d wonder if this is really the case of ‘two great minds think alike’. Or this is another copycatstrategy at work. 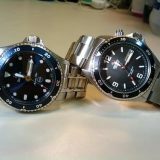 It is common for many tough watch afficionados to be undecisive between Orient Mako and Bulova Marine Star. Given the high level of similarities, not finding yourself confused will be an exception. Let’s step through the various aspects that are important and make a contrast between the two. 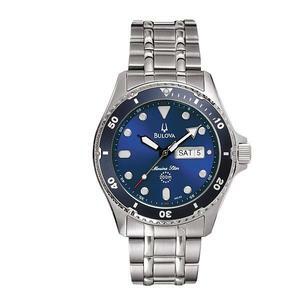 The biggest difference that sets Orient Mako apart from Bulova Marine Star is their movement. Orient is using automatic Japanese movement while Bulova is using quartz movement. For some, this single difference is enough for decision making. If somehow you had bad experiences while replacing your battery at the shop, you may be ruling out quartz battery-powered watches altogether. If this is the case, your choice cannot be clearer. Otherwise, you need to read on further. One thing that I like to consider in choosing my watch is its warranty terms. I know the warranty period is important to some, but that’s not my main concern. My main concern is usually who is covering the warranty. I prefer to stick with manufacturer’s warranty rather than shop’s or seller’s warranty. I think you need no explanation on why this is so. When you buy the Orient Mako, it’ll likely come with manufacturer’s warranty. But for the Bulova, more often than not, you’ll only get seller’s warranty. Make sure you check the warranty carefully before purchasing. 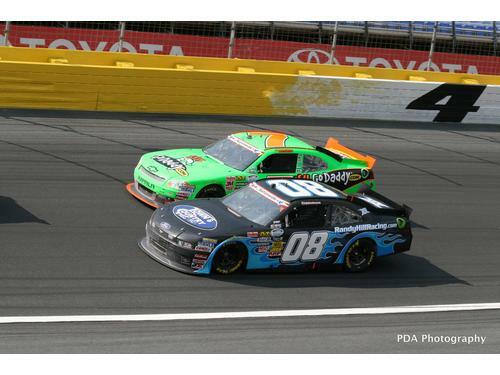 Does this give you enough reason move away from the line and make a decision? If yes, good! Otherwise, read on. The clasps used in Mako and Marine Star are slightly different. The Orient Mako is using a fold over clasp with push button safety. The Bulova Marine Star is using a fold over claps with double push button safety. I have watches using both types of clasp. I have no issue with both. Personally, I don’t see much value in the additional push button. Well, unless you’re really that sloppy. The Orient Mako that is currently selling offers a slight modification to the original version. Maybe it was being compared too much to the Bulova Marine Star. But anyway, the bezel designs of both watches are highly similar, except for their colors. Thank God the markers on the dials are now distinguishably different (unlike the original version). The Orient has a number marking on 6, 9 and 12 position. The Bulova does aways the number marking entirely. Orient Mako displays both the date and day while Bulova Marine Star displays only the date. It depends on how much you rely on your timepiece to tell you what day of the week it is today. Personally, I’m used to reading only the date. Doing away with the day info is fine and in this case, it results in less clutter. The two dials look very much similar but if asked to make a choice, I’d go for the Bulova. Given the price range of the two watches, don’t expect anything more than a mineral crystal. 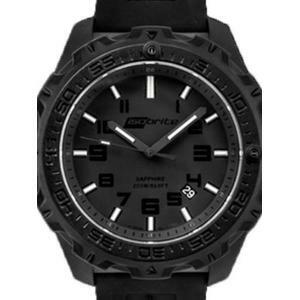 I’d say it is impossible to find a good watch with sapphire crystal at this price. Let me know if there is. I’m curious to know. The case diameter of both watches are almost identical with only 1mm separating the two. However, Orient Mako is slightly thicker with 13mm compared to 10mm for the Bulova Marine Star. I’ve tried both on my wrist and I can tell you the difference between the two is not much. The Mako might be a little heavier and sturdier but it is not significant enough to move the needle away. This is probably the best part of this comparison review! Most folks who are pondering their selection are unaware of the ‘real’ companies behind Orient and Bulova. 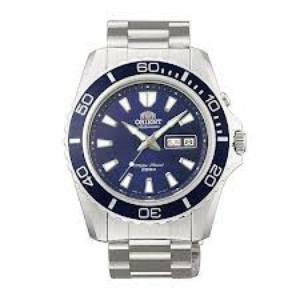 Since 2009, Orient has become a wholly owned subsidiary of Seiko. Bulova, on the other hand, was acquired by Citizen in 2007 as part of the company’s push to establish a presence in US market. In case you’re trying to compare the brand quality between Orient and Bulova, I believe they are both good brands. I know sometimes it is not always wise to expect the same quality from a subsidiary as from its parent brand. But you get the complete picture now. Does This Help You to Decide? You’ve now seen every important aspect that separates the Orient Mako from Bulova Marine Star. You should have a good idea on which model is right for you. In the end, I think the automatic / quartz movement is the most vital punch of this fight. It is the knockout punch that will help anyone pick the winner between the two.